Hey what’s up poker players! Since there is limited online poker in the good ole U S of A, poker players have started playing the competitive game of penny auctions. Are Penny Auctions Legit? Can you really win stuff this cheap? Penny auctions are a competitive game. You can win great deals but it’s not as easy as just saying yes I will buy that iPad for twenty bucks. This is Quibids.com. They are the largest penny auction site in the US in terms of volume of bidders and auctions. You can win stuff, but you can also lose money! If you want to try Quibids – Click Here & Get 3 Free Bids Upon Registering! Penny auctions are a competitive game. There is a risk, strategy and psychology involved, just like poker. That is why savvy poker players poker players are exploiting penny auctions right now as the time is ripe. Penny auctions are not “Discount Shopping Sites” or “Entertainment Shopping” as the TV commercials would lead one to believe. You may have seen the advertisements and wondered, what in the world is quick bids or q bids and how do they sell TV’s for $20 bucks?? These people make for fairly easy competition to beat for seasoned gamblers who understand aggression and strategic game play. Until now, I’ve kept quite quiet about penny auctions to my poker playing friends because quite frankly I did not want the competition! There are enough good penny sites out there and national advertising going on anyway that you are going to find out sooner or later. And especially since poker players have a built in edge in these games… Aggression, psychology and risk taking are all elements of winning penny auctions. It is time you learned about penny auctions. With the holidays around the corner it’s time to put your poker skills to action and win yourself and your family some incredible items in a penny auction. Have you really won? Did you get your stuff? Yes and yes and I know plenty of people who have as well. I’ve won a load of stuff since I’ve been playing and am considerably up on what I have spent on buying bids vs. how much stuff I have won in auction. Gift cards to wally world, Amazon and more. Multiple Watches (I’m wearing my favorite that I won at HappyBidDay, it’s a Seiko Black Monster dive watch that I won for about 40 bids and $14 bucks pictured below. I don’t tell you this to brag or make you think this is simple to do. Winning penny auctions is not simple. Nor is it random luck either. Where you can win real money, or lose real money. And poker players, like you and I my friend… have already developed the skills needed to win! If you apply winning poker strategies to the game of penny auctions then you can seriously rake it in and win more in value than spent! Penny Auctions 101 – What is a penny auction? Get the basics, learn how the game works, how to get started and a few links to winning bidding strategies. 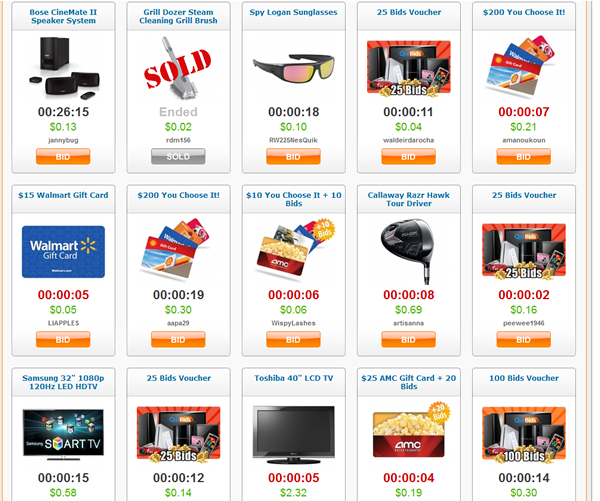 PennyAuctionSites.com – we list the reputable and trustworthy penny auction sites to start on bidding on & the best bonuses available online. If you have watched much male demographic tv programming lately you have likely seen a commercial for one of the penny auction sites listed above. If you are going to get in, get in now before these sites really take off after the general public gets in on it. When you win something, visit back to this page and leave a comment! I’d love to hear what you won and what you thought of the penny auction experience! P.S – my buddies always ask which is my favorite penny auction site… well right now I am loving HappyBidDay.com because I’ve won some great deals, I trust them and they ship things out pronto! You get 20% off of your first bid pack purchase only so if you can swing it, go for the most bids you can right out of the bat. I started with 200 bids and was able to take down a couple of nice auctions including a bar of gold before having to reload. Beezid Strategy – One of the most aggressive and competitive battlefields in the penny auction space. You can win huge items here for pennies if you can play the game well enough. www.HappyBidDay.com is their official website or you can read our review of Happy Bid Day. Posted in Blog, Penny Auction News and tagged online poker, poker, poker and penny auctions, poker skills. Bookmark the permalink. There are several types of pbliuc auctions. Some are government auctions, and some are auctions that take consignments from the pbliuc, businesses, government agencies, charities that get the vehicles as donations, and dealers. What you will usually find is that most cars in the auctions are there for a reason. Either the dealer does not want to put the car on their retail lot and warranty it, or someone donated it to charity because it had problems. You will also find that there are dealers who are at these auctions Depending on the auction, they may have a minimum price set on the car, or the person who consigned the vehicle may be allowed to bid on the vehicle to protect it from being sold at a price that is too low. If a good vehicle comes through from a private seller, they will bid on it if it is priced low. The dealers know the value and will not pass up a great deal.Most all auctions are selling cars as-is, where is, how is. This means that they do not guarantee anything, they many times so not even announce a salvage or branded title. The old saying what you see is what you get applies. Be very careful buying a car at a pbliuc auction. You can end up spending more in repairs than the car is worth.